Everyone nowadays own an Android phone and in India Android phone are found in almost every hand. Even the one who don’t own it now has a thought of the next phone to be an Android. Well you can do anything on the Google’s OS that you do on your Windows PC but one thing that’s not much know is how to take a screenshot of a webpage. Well the one answer that might be in your mind will be Press and Hold ‘Power’ and ‘Volume Down’ button to take screenshot of any screen. Well that is true but what if you’d want to take screenshot of an entire webpage which might be 5000px long or more. Just to solve that there’s an app known as Websnap to help you do so. 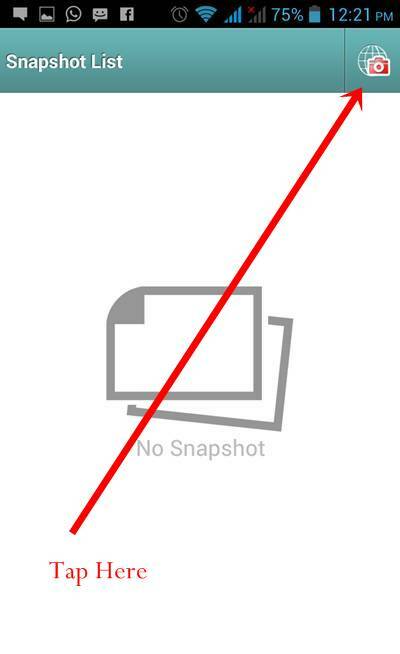 Websnap is a simple Android application which you can use to take screenshot of websites on your mobile device. It can take screenshot of the entire webpage or even some elements on the webpage. Like whether you want to take snapshot of only an article on a blog post, the logo and navigation bar, the footer bar then you can do it using websnap. 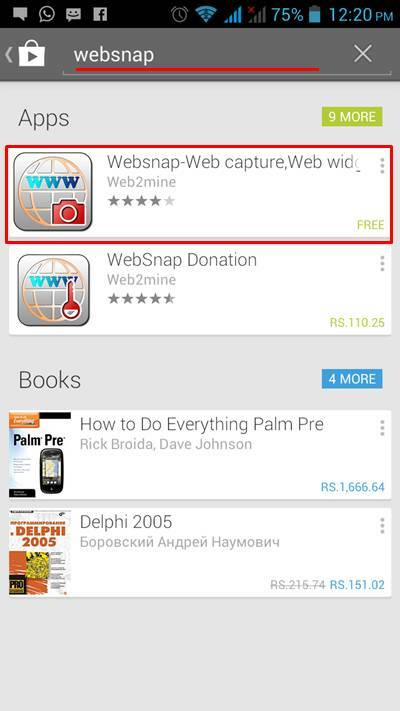 Open your Play Store on Android device and in the search box you can type in ‘Websnap’. The first result is going to be the application itself; below it you could see ‘Websnap Donation’ ignore it and open ‘Websnap-Web Capture’. After you open the app from search results, Install it! 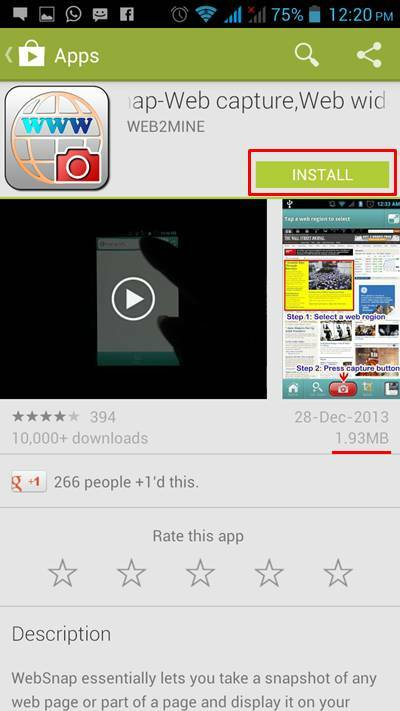 The app size is nearly 2MB which means it isn’t heavy on your system resources. Lets play with Websnap now! After opening the app you will basically see just a blank box with the title Snapshot List. Next to it is a button which will do our work. Click on that button and it will open a new interface. The new interface is where all the magic happens. It is basically a simple browser. 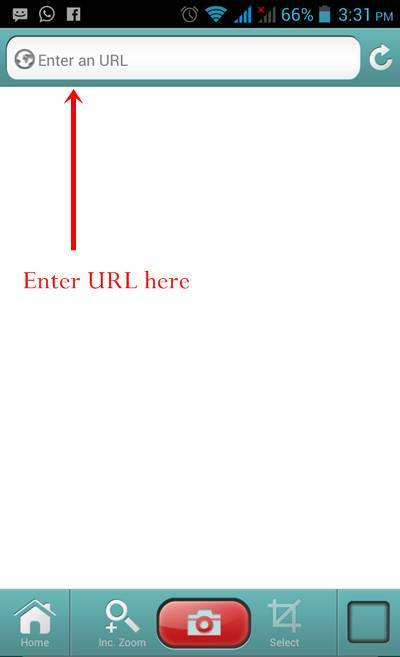 Copy the url of the website you’d want to take screenshot of and paste the url in the box where it says ‘Enter an URL’ and load it. In my case I have used in.yahoo.com as the test website. Entering the url opens up the mobile version of Yahoo. IF the website you’re loading doesn’t has mobile version it would even then be fine because the app can take snapshot of any webpage whether it be responsive or not. Once your website has been shown; tap on the ‘Select’ button right to the big red ‘Snap’ button. Selecting it will not do anything visually but after tapping on it tap on the top element of the webpage which in our case is the logo once. This will show selected element is ‘Yellow’ color now to take whole page snapshot start tapping on ‘Expand’ sitting on the top right corner of the app. Tap it until whole webpage is selected. After you’ve selected the entire web page tap on the red button i.e the snap button and your snapshot will be shown to you. Just like the one shown below. If you still have any queries do post them in the comments below. And if you like it don’t forget to share on Facebook, Twitter and Google+.